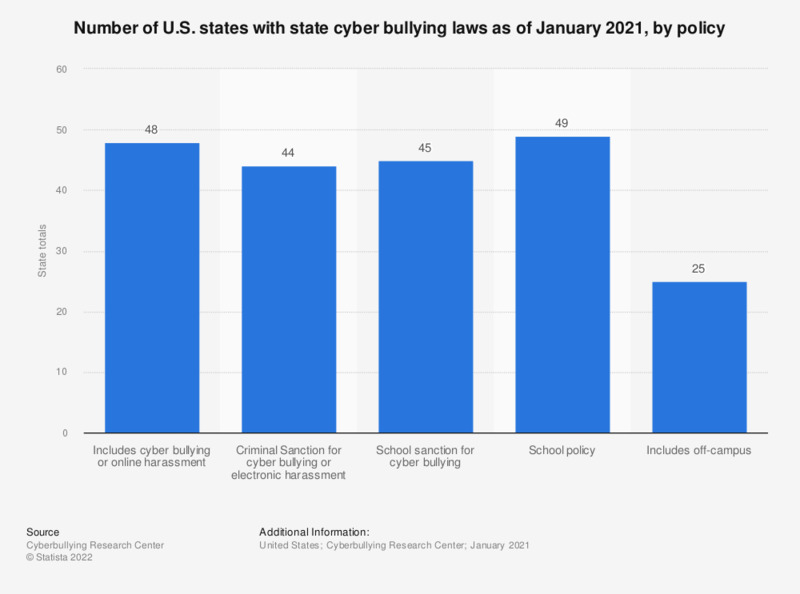 This statistic presents the number of US states with state cyber bullying laws, by policy implementation. As of November 2018, 48 states had electronic harassment laws which explicitly included cyber bullying. A total of 44 states included criminal sanctions in their cyber bullying laws. * Indicates laws that actually include the terms “cyberbullying” or “cyber-bullying.” This is compared to states that simply refer to electronic harassment or bullying using electronic means. ** Federal case law allows schools to discipline students for off-campus behavior that results in a substantial disruption of the learning environment at school. These states have simply codified that standard in state statute.